Kits are equipped with OEM connectors that perfectly match the tow vehicle. This creates a perfect, weather-tight fit. Kits are equipped with wire functions printed directly on the wire. This provides for easy wire identification. Kits come complete with di-electric terminal grease and dust covers to protect terminals from corrosion. Kits are equipped with a serrated edge ring terminal for establishing a good ground. Unplug your vehicle's factory wiring harness and plug in a Hopkins vehicle wiring harness. That's how easy trailer wiring is with a Plug-In-Simple! 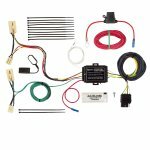 wiring kit, featuring Exact OEM Fit connectors for a perfect, weather-tight fit!